Located on Spains magnificent Orange Blossom Coast in the La Safor region of Valencia, Villa Alvira is situated in a pleasant valley just outside the rapidly expanding village of La Barraca de Aguas Vivas. A private English School with an excellent reputation and a NISA private Hospital are located just minutes away from this property. Beautiful beaches to rival anything in the South of France are only a twenty minute drive away. Protected and therefore unspoiled mountain ranges fringe the area providing a wealth of flora and fauna that is unique to this region. The location of this property offers easy access to the two prestigious, historic towns of Alzira to the north (ten minutes by car) and Gandia to the south (twenty five minutes by car). The city centre of Valencia and its International Airport is only a 45 minute drive away. From Alzira there is an excellent and inexpensive train service that, in only approximately 30 minutes, provides access to the centre of the regions capital city Valencia. There are easily accessible and excellent motorway links to Madrid and Barcelona to the North and Benidorm and Murcia to the south. The villa is connected to mains water, mains electricity and telephone services. There is computer Broadband connection. Villa Alvira consists of approximately 90 sq.m of living area on a plot of approximately 3000 sq.m. There are three double bedrooms, two with hot/cold air-conditioning and built-in wardrobes. The spacious, airy living room has hot/cold air-conditioning and a fully functional wood-burner with hot-air blower motor. There are French doors leading from the living room onto the top terrace. The Kitchen is small but functional. There is a newly reformed bathroom comprising of toilet, bidet and walk-in shower/wet room. The villa has been rewired and retiled throughout. All windows have double glazing with persianas and fly screens. The Villa and the garage are security alarmed. Security lighting surrounds the property. There is a large garage/workshop under the Villa and a fully-tiled lower terrace. The grounds consist of three small orange groves plus several additional lemon trees. A lawn with decorative palms leads on to the lower terrace and the main 10x5 meter fully tiled and filtered swimming pool with under water lighting. A decorative cactus garden leads down to the lower part of the property that comprises of pine trees, naturally seeded palms and shrubs all of which provide a natural habitat for a plethora of birds and wild-life. A third tiled terrace is sheltered by a small vine covered pergola. This terrace is located beside a 3x2 meter fully tiled and filtered plunge pool/Jacuzzi. 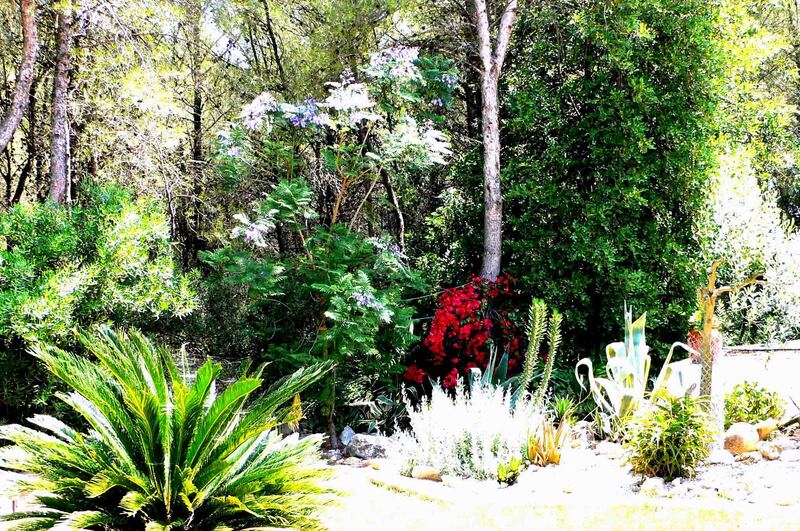 A variety of colorful shrubs, palm trees and flower gardens surround the property.